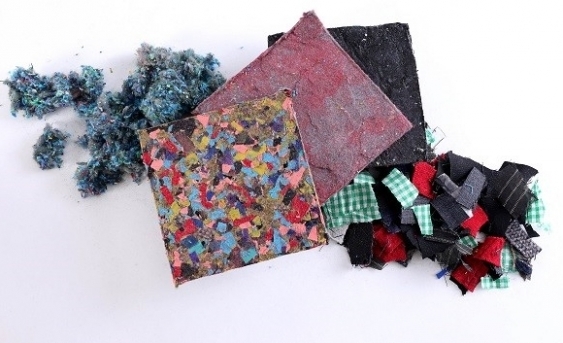 Researchers at UNSW’s Centre for Sustainable Materials Research and Technology (SMaRT) have masterminded an effective method to turn old clothing and textiles into high-quality building products such as flat panels. Led by Professor Veena Sahajwalla, Director of SMaRT, the research team has been using prototype technology developed for a soon-to-be-open, laboratory-scale ‘green microfactory’ to produce high-end composite products that can have a wood veneer look or a ceramic-style finish. These high-end composite products have already tested exceptionally well in labs for qualities such as fire and water resistance, flexibility, acoustic and load-bearing capabilities but have not undergone any formal regulatory assessment. Professor Sahajwalla said the research follows a separate but related exercise that converted used glass into high-quality ceramics suitable for benchtops and tiles in kitchens and bathrooms that can come in all sort of sizes, colours and finishes. This new work builds on technology which can recover and reform materials from electronic waste from UNSW’s demonstration e-waste microfactory launched in April 2018. The e-waste microfactory utilises a process developed by the SMaRT Centre which transforms the components of discarded electronic items like mobile phones, laptops and printers into new and reusable materials that can then be used to manufacture high value products such as high value metal alloys, carbon and products such as 3D printer filament. “There is much that can be done right now given that scientifically-developed, proven methods are currently available through our green microfactory technology,” the Professor continued.